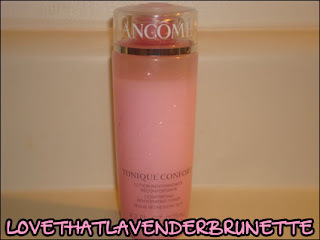 Strange And Pretty: Review: Lancome Comforting Rehydrating Toner. 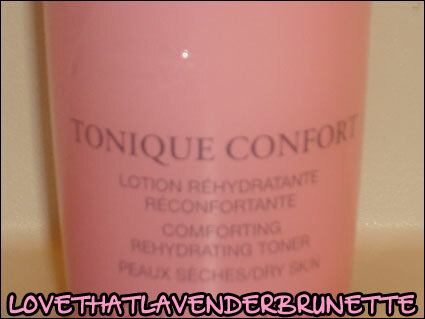 Review: Lancome Comforting Rehydrating Toner. 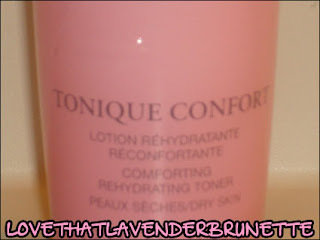 The last toner I used on a regular basis was Clinique’s Clarifying Lotion in Level 3. The first time I ever used that I almost threw up because it smelled like vodka, I should have known from that alone I shouldn’t have it on my face. It was very drying and didn’t do anything to help my skin. That’s a lot coming from me because I actually prefer toners to be more alcohol based – I feel it does a better job of removing whatever my cleanser left behind. But after my drunken toner experience I wanted something a little softer, and this toner was exactly what I needed. It comes out as a milky liquid - it’s a little thicker than something like…water, I guess. The best way to describe it is if you were to mix water with a small amount of lotion. It’s very lightweight, so lightweight I sometimes think there’s no product on the sponge I use to put it on with. Your face doesn’t feel wet or anything afterwards, it just feels very fresh and moisturized. In fact, I’ve sometimes skipped my moisturizer all together because I feel like my face is hydrated enough to do without it. That’s amazing for a toner. Does not sting or smell of alcohol, very moisturizing, leaves face feeling hydrated. Not a fan of how the bottle dispenses product. I’m pretty sure this is the best toner I’ve ever used. It’s changed my mind on thinking a toner is supposed to be harsh and vodka-like. It’s already in my shopping cart in the Macy’s website.